United will no longer offer early boarding to families with children. The line has replaced Continental’s former policy—offering early boarding for groups with kids—with its own less family-friendly approach. Passengers who need extra help may still get an early start, but a party won’t get to board early just because it includes kids. The rest of the industry is split on this issue. Delta and JetBlue, for example, offer early boarding for children; American does not. This is yet another instance of the big airlines’ current focus: They want to favor high-ranking frequent flyers and travelers on expensive tickets—their best customers—over occasional leisure travelers, who exhibit less brand loyalty and buy by price. Early boarding is increasingly important to an airline’s best customers because a head start getting into the cabin gives them first shot at snagging precious overhead bin space. Thanks to checked baggage fees, travelers are relying more on carry-on luggage, and those overhead bins typically fill up well before everyone has boarded the plane. If the bins are full before everyone has stowed their bags, airlines typically will check excess bags at the gate and waive the usual checked-bag fees. But many frequent travelers prefer carrying luggage on the plane, not only to avoid fees but also to avoid waiting for baggage delivery—so the early boarding is a real advantage. 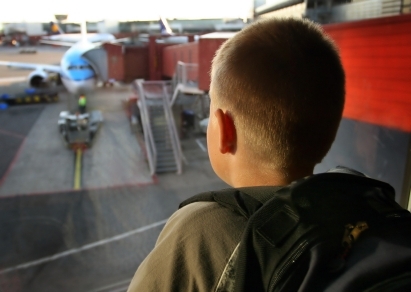 Should airlines offer early boarding for families?